I’m writing about another cat character! 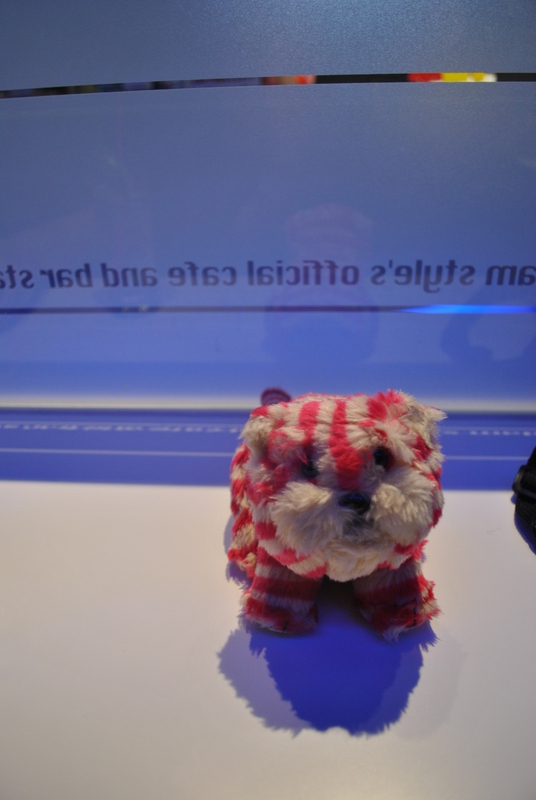 Bagpuss, oh Bagpuss. Bagpuss is a character from an old childrens TV show first shown in 1974 and created by Peter Firmin and the very wonderful and sadly deceased Oliver Postgate. So this was a show that was quite old by the time I was born but it must have still been shown on TV I think as I do remember watching it (along with other Smallfilms shows like the Clangers, Noggin the Nog and Ivor the Engine). The premise is that Bagpuss belongs to a little girl called Emily, who owns a strange shop full of lost, broken things waiting to be reclaimed by their owners. Why am I telling you this when I can show you! The episodes always begin with a new object being brought to the shop and the regular inhabitants trying to figure out what it is. The mice usually try to fix it, Professor Yaffle figures out what it is and then one of the characters gets inspired and tells a story which is told through a little animation. It’s all quite dreamy and very nice to watch when you’re trying to get to sleep. Although Bagpuss is definitely a part of my childhood my current obsession with him really began two Christmases ago when I received a little Bagpuss toy from my Mum. There are a lot of Bagpuss toys out there and some of them are, well, hideous. This one is different. He’s small and fluffy but not soft and has the most mournful expression on his face. I was more excited about this present than, well, just about anything else! I was so taken that I started taking lots of photos of him. The more fun the location the better it is because he always looks sad no matter what angle the picture is taken from. I’ve taken pictures of him looking sad in cherry blossom trees, next to sweets and drinks, at Summer Sonic, next to the Glico man etc. etc. Bagpuss remains unimpressed and this is why I love him. I have a tumblr ‘The Exciting Life of Bagpuss’ which I’ve only recently started updating again where I post pictures of Bagpuss looking mournful next to things. I have quite a large backlog of photos to post. Have a look! And follow me! Professor Yaffle was a carved, wooden bookend in the shape of a woodpecker. What a lovely birthday weekend I’ve had! And in celebration: some rather low quality photos from my ipod, hooray! I have some better photos but they’re on my camera, and it’s late (00.30) and I’m sleepy. People keep pointing out that I am always sleepy. I don’t think I am! Maybe I just say it all the time. Or maybe I don’t get enough sleep. I’m not sure. Perhaps you can tell: I got a lot of cute stuff. A lot of Pokemon stuff and a lot of Kitty stuff. Hooray!! I also had a lovely party which involved cool people, Singstar, Rock Band, beer, pink sparkling wine and cake. Yummy! I have a post on Summer Sonic all written up and ready to go BUT without photos it’s no good and all the photos are on Danny’s computer/on my phone. Heat induced laziness has prevented me from copying them onto my computer! Yeah…heat induced laziness…that’s my excuse! It’s a pretty good one though, kind of. Japan is apparently getting record high temperatures and it’s not gonna calm down til the end of September! Oh help. It’s very hard to walk past this and NOT take a photo. Lots of building work going on around here. People doing the Glico man pose! 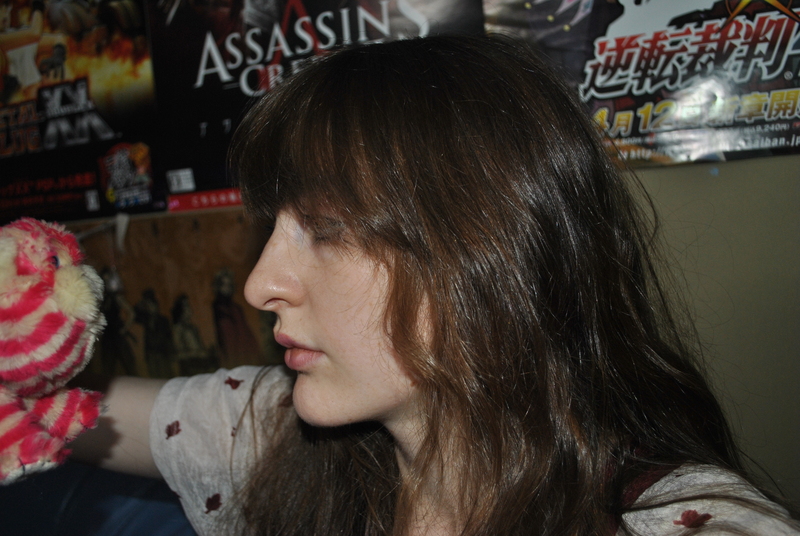 Me, not doing the Glico pose! Otherwise…Akiba was hotter than HOT, it was 36 degrees hot. Ouch. 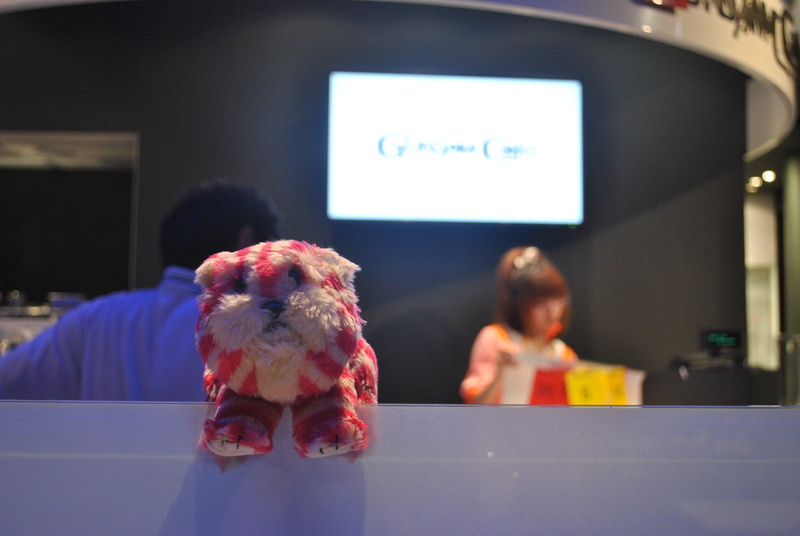 We all went to a maid cafe which was totally awesome. Me and Danny had been to ‘Cure Maid’ the day before, it’s a Victorian style maid cafe, very cute, very traditional and very polite. It was lovely but the @homecafe is something else entirely! We picked the sixth floor and as it happens this was a floor with English speaking maids! So cute!!! In fact, I think I’ll photograph the polaroid I had taken and write a proper post about it later. That’s all for now, I need to go and space out a bit before swimming. This is a fairground ride. No, really! I started a tumblr! It’s all about Bagpuss. Had a quiet evening yesterday. It was very relaxing but then I accidentally stayed up til about 4am. Oops! That’s not relaxing! Also woke up at 8 and couldn’t get back to sleep again. I watched lots of Never Mind the Buzzcocks and QI and also Edwardian Supersize Me. So productive! It was nice though. Watched lots of music videos too. Nick introduced me to a cool band whose name I’ve gone and forgotten. Ah, Lo-Fi-Fnk. Swedish. Their video for the song ‘Marchin’ In’ is lovely. Lots of underwater creatures. 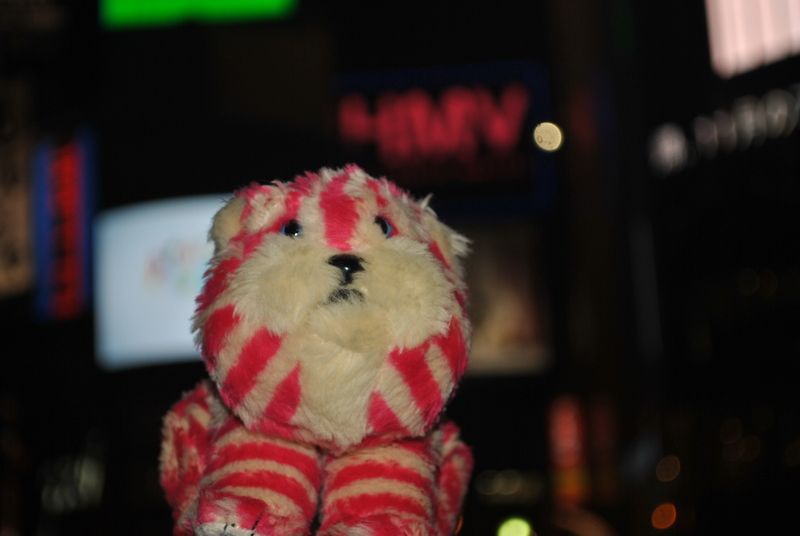 Bagpuss kept me company haha. Other than that, this weekend I have mostly been shopping. I’ll post some photos of the awesome things I’ve bought later! 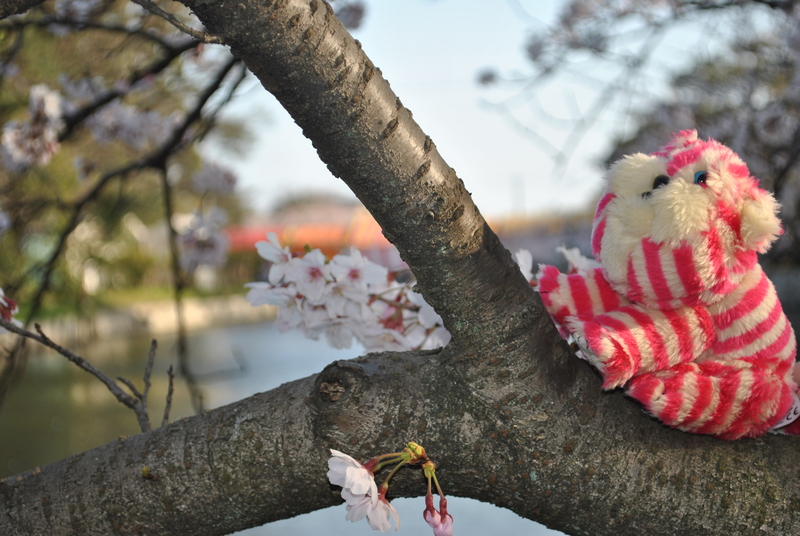 Yes..I put Bagpuss in my handbag and carried him to a park and put him in a tree. Danny convinced me it would be a good idea..and it was!